About 600 million years ago, a massive meteoroid hurtled through space before crashing into the land that would, many millennia later, become known as Namibia. While on its Earthbound journey, it shattered, sending more than 100 meteorites shooting toward the planet, leaving blazing trails in their wake. Held in a fort that once stood for colonization of the area, this museum now tells the history of its indigenous people. A large portion of the space rocks were found around the village of Gibeon, earning them the name Gibeon Meteorites. Even before the start of the Iron Age, local people used the meteorites to make iron tools and weapons. The space rocks gained international attention after Captain J.E. Alexander, an Englishman, found them during his 1838 travels. He sent a sample back to London, where prominent astronomer Sir John Herschel noticed its high quantity of nickel and declared it came from an iron meteorite. Upwards of 150 meteorites were tracked and recovered since the captain’s 19th-century report, though quite a few of the valuable specimens were either stolen and smuggled out of the country or donated to various international research institutions. 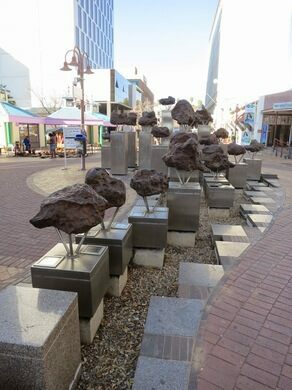 However, 30 of these prehistoric extraterrestrial wonders are available for all to see on the Post Street Mall in Windhoek. 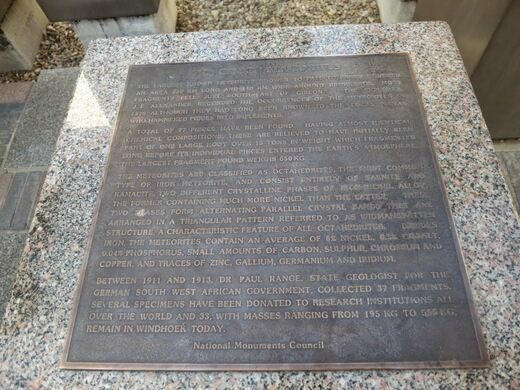 They were declared a National Monument in February of 1950. 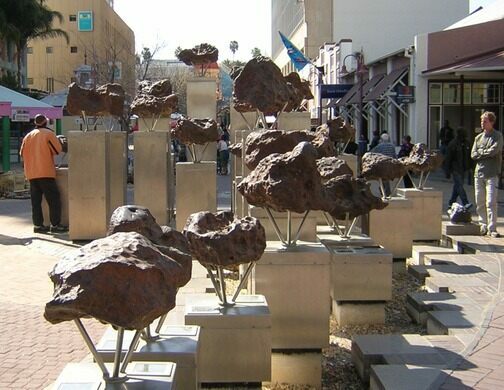 The meteorite display in the Post Street Mall is open 24 hours a day.